Writing this is hard. How do you find the words to fully describe an amazing person like Lesley? How do you capture what she did for all her readers as the editor in chief for Today’s Veterinary Practice? This acronym is perfect. Lesley “did” veterinary medicine. No patient was too small, too hopeless, too difficult, too old, or too “anything.” Each one received her full attention, intelligence, and concern. And Lesley “did” veterinary education, through working with students, lecturing, writing, and editing. Every concept and every article included in the pages of TVP received her caring, intellectual assessment. Her goal was to make the information as clear, concise, practical, and readable as possible. Lesley and I became colleagues in 2011 when TVP was a fledgling journal. I met Lesley to interview her for the editor in chief position, and my fear was that she would not have time to work on a new journal. I was surprised when she, instead, voiced her qualms about whether she had the talent for the job. As enthusiastic as she was about joining our team, Lesley was humble at heart, and evaluated her experience objectively. Turns out that, despite her concerns, she was a natural. One that always found time to carefully assess and help create articles, columns, and ideas that made TVP what it is today. However, humility doesn’t lead to insecurity. Lesley had an inner strength and confidence that allowed her to do everything well. She taught me that it was never good enough to settle. That the only way to do a job was to push myself, and those around me, just a bit harder. To ask for the best from each of us. This drive came from the fact that those receiving the benefits of our journal were ultimately veterinary patients. Patients that didn’t have a voice. Through TVP and its readers, a voice was given to them, one that insisted on compassion and the provision of best medicine. Lesley not only touched my life through work, but also through another passion—we shared a mutual love for horses. 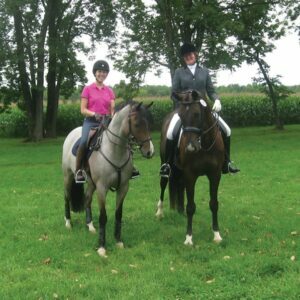 Lesley pursued dressage, and the same precision and empathy that made her such a skilled veterinarian also led her to success with her beloved horses, Hank and Romy. For as much as we discussed work, we discussed our “other lives,” the lives that we shared with our equine friends. Lesley always had encouraging words for me, wisdom only gained through a lifetime of experience with these creatures that allowed us to dance with them. Just as with the journal, she gave them her all and inspires me every day to do the same. Lesley G. King, MVB, Diplomate ACVECC & ACVIM (SAIM), died May 14, 2016. Dr. King was Professor of Critical Care at the University of Pennsylvania School of Veterinary Medicine and the Editor in Chief of Today’s Veterinary Practice. She was instrumental in the development of the veterinary intensive care specialty and trained numerous emergency and critical care residents, interns, and technicians. Dr. King received her veterinary degree from University College Dublin School of Veterinary Medicine, and then spent her entire career at PennVet. She was surrounded by her closest family and friends during her last days. Contributions can be made in Dr. King’s memory for a student scholarship at University of Pennsylvania School of Veterinary Medicine; for further information, visit www.vet.upenn.edu/about/press-room/press-releases. Lesley told me about her cancer last fall, and her reason for not telling me sooner, despite both of us facing our own health challenges, was completely unselfish. She did not want to burden those around her with her news. Lesley preferred that we treat her no different than if she was perfectly healthy. I was shocked at the news. Lesley approached life with such zeal that I didn’t know how she could do all she did, and fight such a horrible disease, with a smile on her face at all times. She never complained, never felt sorry for herself. Lesley made sure to make her life full, and told me this spring, when she knew the end was near, to remember her at her best. And now, I find that I remember Lesley best when I ask myself, “What would Lesley do?” With that mantra, Lesley is always with me, when I edit, when I ride, when I live. Kelly and Rally, left, with Lesley and Romy. We encourage you to share your own stories about how Lesley has touched your life. In what ways do you ask yourself, “What would Lesley do?” You can email them to ksoldavin@navc.com.